We offer a wide variety of folding and inserting services for our clients including the highly effective and low cost Rip 'n Read mailer. With the Rip 'n Read mailer we exclude the use of an envelope. In other words the statement and envelope are the same piece of paper, leading to reduced production costs and carbon emmissions. CAB produces it's Rip 'n Read mailer from standard A3, A4 and A5 sheets of paper. At CAB we have the combined capacity to process very large quantities of Rip 'n Read mailers per day in Johannesburg, Cape Town, Durban and Port Elizabeth together. 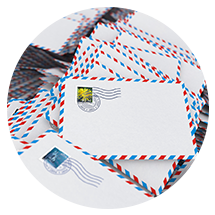 Post delivery reporting on mail integrity, quality, quantity and turnaround time.